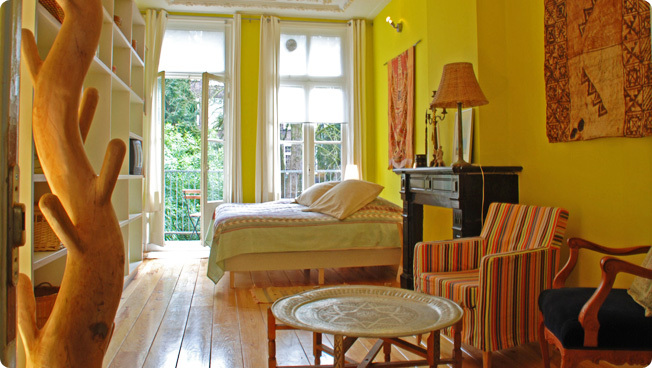 B&B Colours is located in the heart of the most colorful and popular neighborhood of Amsterdam, de Pijp. Albert Cuyp market is around the corner and all the latest hip cafes, restaurants, musea, canals, coffee shops and the beautiful Sarphatipark are situated within walking distance. With two divers stylish large rooms, decorated in a mix of the authenticity of the late 1800's townhouse and eclectic furniture elements, B&B colours offers the perfect place to stay. Central, quiet, colorful and with a view on the largest ‘tropical’ garden in de Pijp.